Halibut is a large, flat, saltwater fish that inhabits the sea floor in the cold waters of the North Atlantic and North Pacific. An average halibut grows to about 30 pounds and 3 feet in length, although some catches have been up to 500 pounds and over 8 feet long. 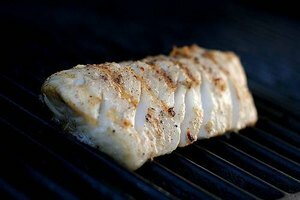 Halibut has mild, almost sweet flavor and can be cut into fillets and steaks. 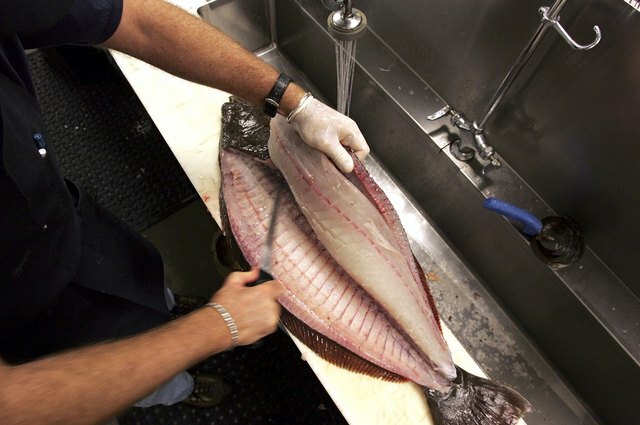 Fillets of halibut are traditionally cooked with the skin removed. A fillet knife and a flat cutting surface are all you need to remove the skin from halibut fillets. Place the halibut on a flat surface, such as a cutting board. Cut a diagonal line into both sides of the halibut along the backbone, avoiding the stomach cavity -- which will feel hard to your fingers. Make a small incision, cutting away from your body, into the flesh to locate the bones. Cut away from your body along the bones, using small cuts, and slowly peel the fillet away from the carcass. Separate the fillet from the carcass along the top or bottom. Repeat Step 2 for the other fillet on the side you are cutting on, then flip the halibut carcass over and repeat for both fillets on that side. 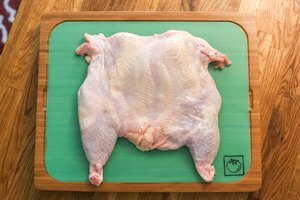 Lay a fillet skin-side down on the cutting surface, close to the part nearest you, with the tail end section opposite of your dominant/cutting hand. Press the fillet knife against the end of the tail. Make a slight cut into the end of the tail piece, between the skin and the flesh. Hold the skin with your non-cutting fingertips, and slide the knife along the edge of the cutting surface -- angling the knife blade upward ever so slightly, until you get to the other end of the fillet. Adjust your grip on the skin as necessary, to keep the fillet from moving while you cut. Repeat the process for the other three fillets. Trim away any skin pieces that were missed in the initial cut, by cutting along the flesh of the fillet.